OK, so we didn’t really swap fabrege eggs… we made Artist Trading Cards inspired by them. I got these last week on Wednesday, right before we headed out of town for a funeral. I apologize for being late to my wonderful swap-ees, Trish, Katherine, and Agnieska (from Poland!) These are gorgeous, and now I have to find a clever way to display them next Easter. 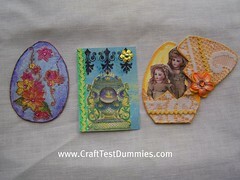 I only hope that my swap partners were as pleased with my polymer clay ATC’s. Usually my CPS yahoo group sticks to cloth and paper… not too much clayin’ going on there. Maybe I’ll start a trend!